It was a warm, stuffy night in Sydney. My Arcadia University study-abroad group had just returned to the city from a journey in Western Australia, visiting Aboriginal communities, driving through brush fires, and exploring the vast, open plains of Oz. While we traveled in the bush, we figured we would live like people of the bush, at least in regard to our facial hair. We agreed on the West Aussie Mustache competition, which would see us pit our staches against one another at the end of the journey (if my earlier post didn’t make it clear, I really enjoy being able to grow a mustache). We decided that a night in commemoration of the staches, along with a nice end to our journey through Western Australia, needed an appropriately epic, exciting meal. We had heard of a restaurant, in Old Sydney just near the bridge, that had certain specialty pizzas available that might suit just such a yearning. We all know pepperoni, sausage, cheese: the standard accouterments for ordinary pizza. This wasn’t an ordinary pizza. This celebration, these mustaches, required something much more daring and exciting. After all, our mustaches said “daring” if nothing else. 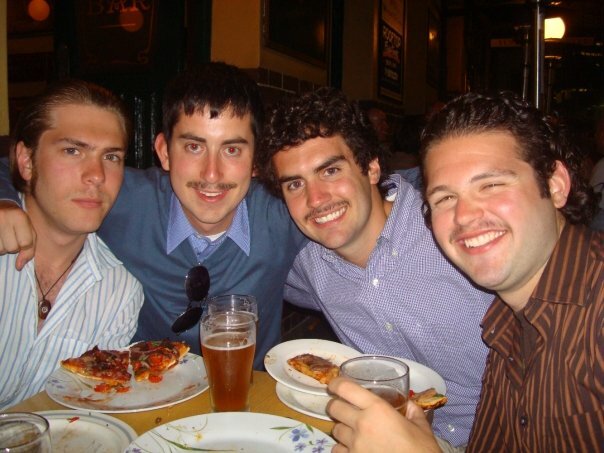 I will never forget that warm night in Sydney as we, the four mustachioed amigos and our three female companions, a group from Arcadia University, chomped down on ostrich, emu, and crocodile pizza for the first time. And, it turns out, they all really do taste like chicken.